For New Year’s Eve, I made Modern Honey’s Love at First Sight Chocolate Cake for a night of champagne and games with friends. Inspired by the game “Dream Phone,” I primarily chose the recipe based off its name, but was impressed and delighted by its velvety crumb and smooth chocolate flavor. 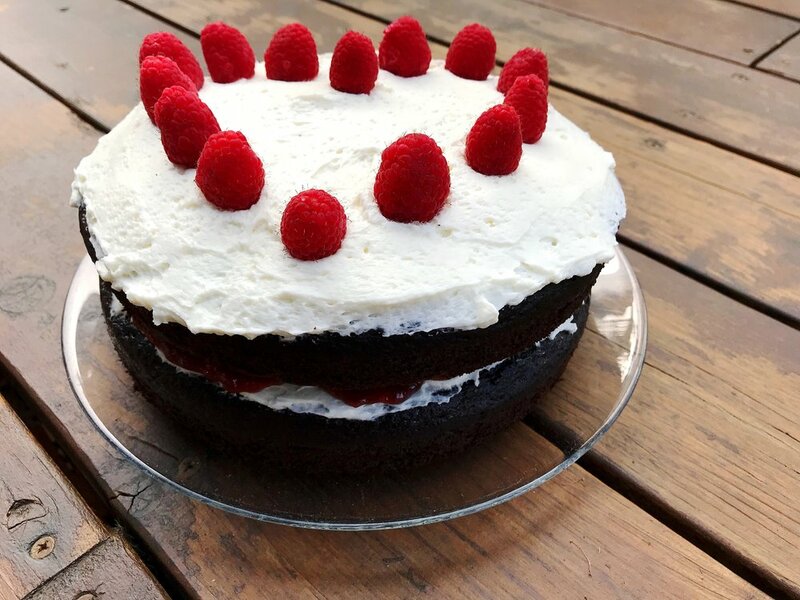 I have made a few alterations to the recipe and paired the cake with a vanilla buttercream frosting and raspberries to mix it up. For reference, Dream Phone is a ridiculous game with a lot of laughs. The goal is to find out the name of the boy who likes you. While this goes against my modern woman ideals, it is still an entertaining game. There are 24 boys in 6 different locations with different outfits and interests. You dial a boy’s phone number to get a clue. Example: *ring ring* Hello! He looks good in whatever he wears, but he’s not wearing jeans! Buzzfeed has a definitive ranking of the boys for your reading leisure and a quiz to find your Dream Phone soulmate. If you need more visuals, watch this Dream Phone ad in its low quality glory. With Valentine’s Day coming up and Emily and Rose living the #whole30 life, I wanted to post this recipe for you to make and share with your SO/friend(s)/whoever this season. This simple, decadent cake will be a delicious showstopper. Preheat oven to 350F and prepare 9-inch pans. Whisk all dry ingredients in a large bowl to create a smooth, clump-free mixture. In a separate bowl, lightly beat oil, buttermilk, eggs, and vanilla to add air. Add wet ingredients (don’t forget the warm water) to dry mixture. This will look like a liquid overload at first, but patiently combine until you have a batter. Pour batter equally into 2 pans. Cook for approximately 25-29 minutes. Let cakes cool in pans on racks and once slightly cooled, transfer cakes to racks to rest and cool. Use an electric mixer to combine the softened butter with powdered sugar. I did this half a cup at a time and added the vanilla and milk after the first 2 cups of powdered sugar. Place a cake round on a plate or cake stand and scoop enough frosting onto the first layer to cover the top. Spread evenly. Stir jam in a ramekin to make it spreadable and set onto the buttercream. Spread evenly. Place cake round on top. Use the rest of the frosting for the top of the cake. Spread evenly. Add raspberries or fruit of your choice. Optional: sprinkles, edible glitter, anything! Trace your cake pans and cut out perfect parchment circles to line your pans. Choose your favorite frosting and favorite fresh fruits or jam. For center of cake, try layering buttercream then jam then buttercream. 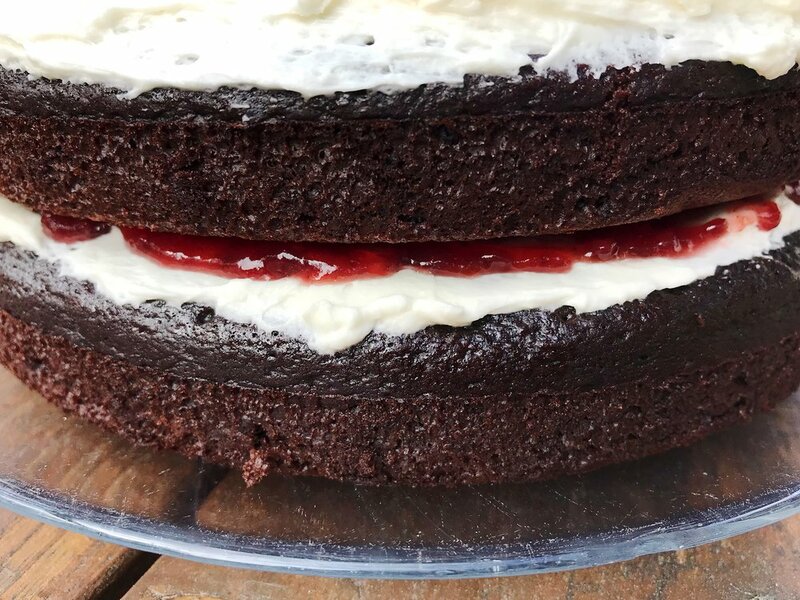 With just buttercream and jam, the cake was a little slippy. Keep the sides of the cake frosting-free to show off the cake and middle layers. My cakes came out even on top (no big dome), but trim cake tops down if needed.